this SDI to AV or CVBS converter supports many image enhancement and handling technology such as color conditioning, 3D denoise, interlacing/progressive video conversion, video amplification/scale, frame rate convert to guarantee image conversion meet professional quality standards. It can convert SDI signal to CVBS(AV), and our products can deal with resolution ratio, frame rate and image scaling of different interface. Audio signal that embedded in SDI could output to analog circuit output interface through separating and converting. 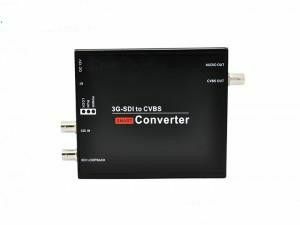 Our SDI to AV or CVBS converter supports remote control operation and could connect USB with PC for higher setup or firmware upgrading. it is equipped with free PC port management controlling software. Our product is widely applied in multimedia broadcast, program production and edit in broadcasting and television, HD video information release, HD video remote transmission, video conference, multimedia advertisement and video security monitoring etc!